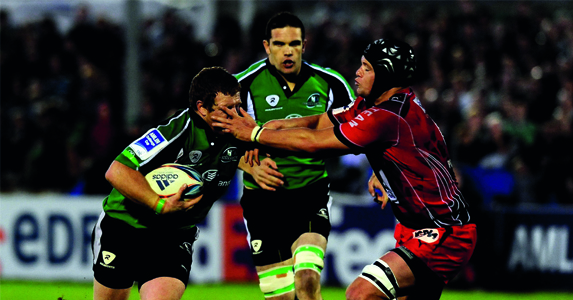 Eric Elwood – Connacht Rugby’s record points scorer – faces his first Amlin Challenge Cup contest as the province’s new coach accepting they know precious little about their Round 1 opponents. Italian club I Cavalieri Estra will be making their European debut when they welcome Connacht Rugby – who will be playing a record 93rdtournament match – to Stadio Lungobisenzio on Saturday. “We sent a guy over to Italy the weekend before last when they were playing Lazio in the Super 10 and video of that one game is what we will be working off in preparation for Saturday,” said former Ireland outside half Elwood, who scored 473 points in 53 Amlin Challenge Cup appearances for Connacht Rugby. “That was the best we could do so we have to take our chances from that one game and then hope there are not too many changes in their team. “However, what it has told us is that they have a couple of big, good ball carriers, big centres and a solid goal kicker. “We will have to keep our discipline, not give away any silly penalties and easy points and, if we play to our full capabilities, we should be okay. Connacht Rugby have been the only ever-present team in the history of the tournament, reaching the knock-out stages seven times in 14 attempts, and if they can qualify for the semi-finals for the fourth time they will be the first team to play in 100 matches in the competition. “It is really exciting to be going into another European campaign but we know we are in a tough group,” said Elwood. “We have not played Bayonne before either but they were riding high in the Top 14 while I know Harlequins and John (Kingston) very well so there is a bit of history there. “We know how tough the French teams are but we have never feared going to France and, after five Celtic League matches in a tournament that is very competitive and physically demanding, that is a great way to prepare for Europe. “We hope to have our skipper John Muldoon back for his first game since breaking an arm on the Irish tour and we are very happy with how Ian Keatley is coming on – he is a work in progress but he is developing really well and working extremely hard on his game.